The introduction of the celebration of mass during the Oktoberfest dates back to the last century, and more precisely to the year 1956, when it was celebrated for the first time. This was intended for the carnies and the merchants only and was introduced by the Catholic Circus and the Exhibitors Union (der Katholischen Circus- und Schausteller sorge), because of their desire to testify to their affinity to God. 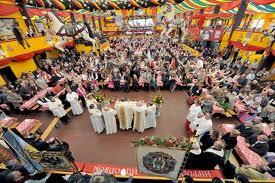 Today as previously, this tradition takes place in the Hippodrom and it is now impossible to imagine the Oktoberfest without it. The themes during the celebration of the mass are not just the difficult work of the carnies and the merchants, but the deceased members of the families, relatives, friends and colleagues are also remembered. 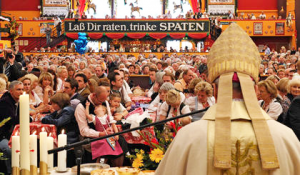 In 1956 the first mass was celebrated by Father Heinz Peter Schönig, shortly before he was elected director of the Catholic Circus and the Exhibitors Union (der Katholischen Circus- und Schausteller sorge). Every year during the mass, the sacraments of Baptism and Confirmation are performed.